I give you my word | An honest (and occasionally witty) account of living with M.E. An honest (and occasionally witty) account of living with M.E. 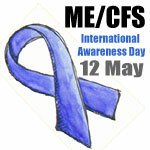 Today marks the start of ME awareness week, leading up to International ME/CFS Awareness Day on Sunday 12 May. Although I’ve had ME for over six years, this is actually the first time I’ve known that there was any such thing. Which just goes to show how much more awareness raising we need to do. Admittedly I’m not known for being observant, often trundling around in the clouds, but if someone with ME is oblivious to the International Day, then it doesn’t bode well for the rest of the world. With that in mind I thought I would dust myself down and get back to blogging. Sadly I’ve been absent for a few months due to my current relapse, but this weekend I’ve been feeling stronger so I am keeping my fingers crossed that my body is slowly healing itself again. Providing that I don’t do my classic thing of shrieking ‘yippee’ and running around like a mad person cramming in all the things I’ve been day dreaming about for weeks, that is. You’d think I would have learned to know better by now. But no. Boom and Bust will continue to be my middle names for the foreseeable future. 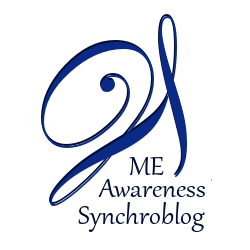 I have also been inspired this week by the ME Awareness Week Synchroblog, the idea of Lydia Hendry, as described on her blog A path through the valley. How does it work? Well on each of the designated days there is a host, who posts a blog on the specified topic and invites others in the community to post, comment, tweet, and generally join in. Today’s topic is “Being a good family/friend/carer” and is hosted today by Arielle at Dear Little Disease. At first I thought it would be easy to write on any topic related to ME, but then I realised that this is probably one of the hardest ones going. It’s quite an emotive subject as you can bet your bottom dollar that we’ve all very quickly found out who our real friends are. And that is an extremely painful lesson to learn at anytime, let alone when your body resembles some concoction of defective factory parts put together by the night-shift for their own amusement. In truth almost everyone will have multiple circles of friends and acquaintances, and it’s only when push comes to shove that we find out which circle each person fits into. But without that chronic illness or other life-changing event, the majority soldier on whilst being blissfully unaware of the true occupants of their inner circles. But those that are privy to the centre circles and have stuck by through thick and thin are valued more than they could ever know. And a large part of that value is based on acceptance. They accept who we are, what is happening to us, and listen and share in both our frustrations and moments of joy. They don’t dismiss our symptoms or pretend they understand what it’s like. They offer sympathy and understanding to things that cannot be explained. And they offer the all important able body of course. And in return, we must accept their help. For living in denial and refusing the help we need will only push those that care for us further away. Now I know that if all the above were the key responsibilities in a job description, I would never match up to the essential requirements and would feel woefully underqualified for the job. And that’s without the able-bodied bit. But being family, a friend or carer doesn’t require perfection. Just like those with ME have good and less good days, so can those closest to them. Occasionally my husband forgets that its ok that he is not able to just fix me, and he tries to counter all my complaints with suggestions of things I should do about them. Which of course never goes down well as if I could do something about it then I jolly well would have done already. But then I regularly forget that things are often not as bad as they seem, and it’s my expectations of what path my life should be on, combined with my tendency to worry about the future, that are out of whack and can blow things out of proportion. Sometimes the smallest achievements actually turn out to be the biggest ones. Bottom line? Perfectionism is not good for your health or for those around you, and learning to recognise and accept the things we cannot change is a healthier recipe for life. Pacing is still probably the hardest thing I face on a daily basis, even now. I’m sure I must have many talents, but patience is definitely not one of them. By October 2007 I was finally managing between six and seven hours a day at work. Although it had taken me almost 12 months to get there I could see that I had made huge progress, albeit it heavily focussed to this point on regaining my working rather than social life. I had also accrued quite a lot of annual leave. Being one of those people who feel motivated to spend every day off ‘doing something useful’, I wanted to get away and achieve something with my holiday. I also really wanted to go somewhere rather sunnier and warmer than the UK (which isn’t difficult). So my boyfriend and I took the plunge and decided to book a holiday abroad. I’d already had to turn down a skiing holiday earlier that year with a friend living in Switzerland. Not that I would have been any good, having never skied in my life and also at the time I was finding the simple act of standing for any length of time rather trying, but I like to think it would have been fun. Spending the day on the spectacular slopes, basking in glorious sunshine. Then apres ski, snuggling in a warm cabin with great food and wine. The reality would of course have been more like this; me mostly sat on the floor nursing bruises on my arse whilst kids of five whizz down the slopes shaking their heads at the old lady who couldn’t find her balance. And that is before you factor in the ME. I suppose the added dizziness would have given me the perfect excuse to spend most of the day falling over. But then the fact that back in February I was only able to be upright for around 3-4 hours a day at most probably meant the trip wasn’t going to happen. On checking out the best places for October sun we decided on Rome, a destination we’ve always wanted to go to and somewhere that would be warm, with good food and some culture to hold our interest. I in particular am extremely bad at not doing anything on holiday. In fact, spending all day by the pool is my worst nightmare, as evidenced by the one time I’ve tried a holiday like that. I think I resembled someone with ADD, unable to sit still and always getting up for a snack, or to get a drink, or to go for a short walk, or well, anything that wasn’t just sitting relaxing. I was so bad at it, it almost became kind of funny. Of course, Rome is a vast place full of things to see and also a lot of walking. When your body is still reminiscent of a frail old lady, it may not be the easiest thing to do. Naturally I never do things the easy way and decided to see these things as a challenge rather than problem, so I told myself it might be good as part of my recovery. Most people tend to spend only a few days in Rome, cramming in the sights and then returning home or heading off to another destination for some relaxation away from the hustle and bustle. But given my rather limited mobility and need for a good break, we decided to make it 10 days in Rome, building in an allowance for my rather useless body. We rented an apartment not only as it was more cost-effective, but also because it would give us more freedom for days when I had less energy as we could cook for ourselves instead of walking around searching for an affordable restaurant. We chose a place that was around five minutes walk from the Pantheon; a relatively central area with good restaurants nearby, but not too noisy. The flight there and connection from the airport pretty much took it out of me on the first day. We arrived late afternoon, so by the time we’d got the keys to the apartment there was time for some rest before going out for dinner. To the closest place we could find. The next day I was left to rest and sleep in. We’d prepared well for the holiday, so my boyfriend had brought his Nintendo DS and a new Zelda game to keep him entertained during the times that I needed to rest. We ventured out at lunchtime and then walked to the Pantheon to look around. The piazza around it was filled with tourist cafes, pricy but convenient for a well-earned rest. Although it was only a short walk from our apartment I was cream-crackered for the rest of the day, so strategic use of cafes allowed me to regain a bit of energy for the walk back. Over the next couple of days I was able to venture a bit further afield before the overwhelming tiredness came back. We made it to the Trevi Fountain and Spanish Steps; two more sights to tick off the list. Of course, as most who suffer from ME know, a day or two after you increase your activity, the payback kicks in. And as usual it did, so we then had a day in the apartment. My boyfriend bought groceries from a local shop so we, well ok, he, could cook for us without having to go out in search of dinner. Rested and ready to embark on new adventures again, over the next few days we visited some more of the obvious major sights, taking one each day. We had planned it out so at the start of the holiday we were visiting the nearby attractions and ones that required the least walking or energy expenditure. Slowly but surely, I began to regain confidence and my body grew stronger. The twice daily trips to the local gelaterias were of course an essential part of this recovery. Towards the end of the trip, we planned to visit the Vatican museum. Well known for its extraordinary wealth of artefacts, treasures and the Sistine Chapel, I had wanted to be as strong as possible to get the most out of it. We arrived just before opening in the morning, and incredibly spent the whole day there, walking around the exhibitions until just before closing. In my wildest dreams I had not thought that I would have been able to do that so soon, not even as the holiday progressed. The strength I had gained was quite astounding. I’d like to be able to say that when I returned home I was significantly better, but reality can often be rather crueller than that. Back home I returned to work, and once again my daily energy reserve was being split between physical and mental tasks. But then as Rome wasn’t built in a day, or even ten days, then it was ok that I had returned back to pacing and once again focussed on recovery. 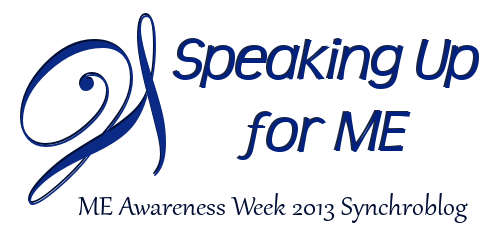 All material on the I Give You My Word site and Blog is copyrighted. Unauthorised use of any material will not be tolerated. Copyright © 2012-2013 Lizzy P. All rights reserved.